For almost ten years I have been compiling photographs made by people who have experienced being homeless. In 2006, after collecting around 10,000 photographs, negatives and ephemera created by over 250 people, I was keen to examine an established photography archive to reflect on some of the practical, theoretical and ethical issues potentially involved in constituting an archive. 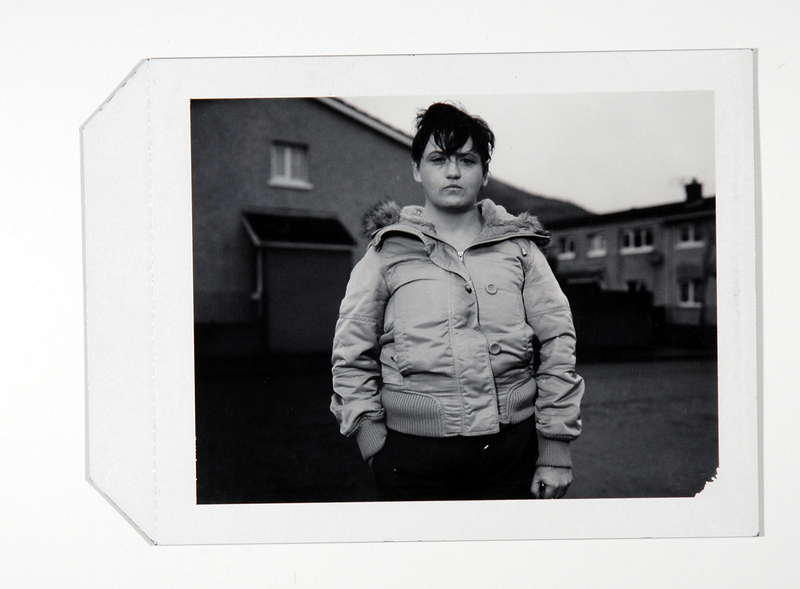 Over the following two years I took my inquiry to Belfast Exposed Photography and I created Residency, a new body of work with homeless people living in Belfast. Doing so enabled me to develop my questions for the collection and its possible transition to a public archive; to reflect on the complexities of potential decisions to be made around the constitution of an archive in relation to representational responsibility, participation and interpretation, and how this might impact on history and memory. This article contextualizes images from Residency in a critical process of enquiry and remembrance in order to question representation and identity as constructed through the archive. 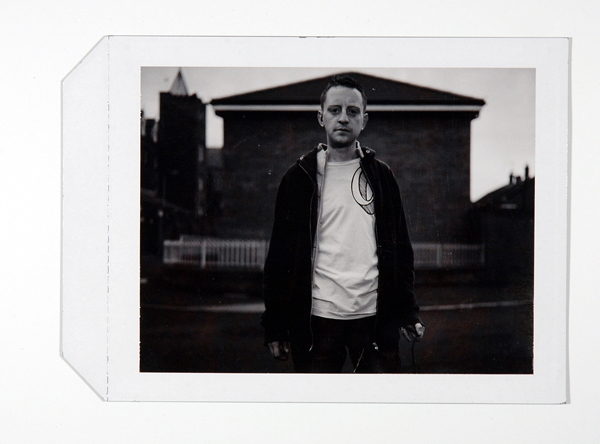 Polaroid from the making of Assisted Self-Portrait of Sean McAuley, Residency, 2006–2008. There is no political power without control of the archive, if not of memory. Effective democratization can always be measured by this essential criterion: the participation in and access to the archive, its constitution, and its interpretation. I first travelled to Belfast in November 2006. By that time I had spent almost five years compiling photographs made by homeless people living in London. Finding myself excited but uneasy about occupying a position of guardian to a growing collection of negatives, photographs and ephemera created by over 250 people, I was uncertain as to whether this material was best considered a record of my investigations into representation or if the collection should somehow be manifested as a public archive. In attempting to unravel this question, I was keen to examine an organization that housed a collection of photographs to reflect on some of the practical, theoretical and ethical issues potentially involved in constituting an archive. The words of Stuart Hall resounded: “constituting an archive represents a significant moment in which [one] needs to reflect with care . . . when a relatively random collection of works [becomes] something more ordered and considered . . . an object of reflection and debate” (“Constituting an Archive” 89). I wanted to work with an organization that had evolved outside the collective enterprise of agencies of the state and commerce concerned with the invention, presentation and preservation of natural and cultural products. These agencies, which often exist ostensibly for the purposes of public education and entertainment, are largely invested in propagating mainstream narratives of cultural memory and heritage (Samuel). I wanted to take my enquiry to an organization that had evolved out of the grassroots activities of an individual or group of people who were interested in representing the identity of their community and locality in opposition to the dominant narratives being generated as their history (Flinn, Stevens, and Shepherd). Before I began working in Belfast I was aware that many people invested in the practice, theory and philosophy of archives had effectively deconstructed the myth of objectivity in the archive (Cook and Schwartz; Derrida; Johnson; Sekula). Archives are partial, subjective and open to interpretation. Allan Sekula has described the protean quality of the archive as being a “clearing house of meaning” whereby photographs are liberated or abstracted from their semantic inscriptions and the social conditions of their production, making the image available for new uses in new contexts (154). Archives facilitate the reappropriation of representation. As such, preferred or dominant writings of history and memory may be crafted just as alternative or subversive readings and re-writings might be negotiated or suggested (Edwards, Raw Histories; Hall, “Whose Heritage?”). However, the signification or creation of meaning in any archive is contingent and contested, and is unable to be prescribed purely from the archival material alone. It is in the articulation or in the transaction of a text with its audience and their consuming practices that meaning is formed (Hall, “Reconstruction Work”). Representation in the photographic archive may be perceived as a negotiation between the archive user, the semantics of the photograph and the contextual anchorage of the archive itself, and the interplay of the social, political and cultural make-up inherent in all three. In considering the potential transition of my collection into a public archive I was curious about the complexity of the relationship between the archive and representation, and the possible implications for material considered to be a self-representation. All practices of photographic representation evoke questions of responsibility, regardless of the production methodology employed by the photographer and subject (Rosler, “Post-Documentary, Post-Photography?”). How the photographer or archivist chooses to frame the photographic text in an archive may not entirely predetermine its accessibility, reading or use, but it will have bearing on the articulation of that text in the production of representation. Decisions made in relation to the constitution of an archive will contextualize its contents in specific ways that may influence the representation of who or what is signified in the image. While an archive user might be able to see through the partiality of the material held in the archive and the archiving practice itself, I wondered: what might be some of the complexities of the role of the archivist in organizing and shaping the material under their care? Could I maintain the subject/participant’s intentions for their photographs in a public archive? Would it be possible to extend self-representation and the participation of a subject/participant through the constitution of an archive? What impact might this have on the constructions of representation, history and memory? 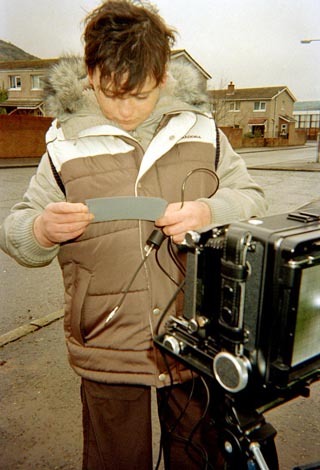 In my research into community archives and photography projects set up by individuals and grassroots organizations across the United Kingdom since the early 1970s, I became particularly interested in an organization called Belfast Exposed Photography. Belfast Exposed evolved out of the work of a small group of photographers who felt compelled to attempt to counter mainstream representations disseminated of Belfast during the Troubles. In 1983 they advertised for people living in Belfast to submit photographs for an exhibition in a community centre that would show “amateur insight into the varying images of Belfast” (O’Reilly 2). The exhibition was popular and there was demand for it to expand and travel to other venues in the city. For almost two decades variations of this show toured throughout Northern Ireland and the rest of the United Kingdom, as well as travelling to various places abroad including Dublin, Berlin, Los Angeles, Rome, Moscow and Geneva. Alongside organizing exhibitions the Belfast Exposed photographers documented events unfolding on both sides of the sectarian conflict and facilitated community photography projects in the loyalist and nationalist areas of the city. The group eventually constituted themselves as an organization, establishing a centre with a darkroom, education workshop, gallery and archival storage for the negatives created by the photographers and their workshop participants. The early history of Belfast Exposed, their archive and the organization’s continued critical engagement with socially and politically motivated photography chimed with my underlying interests in the critical rethinking of documentary production and dissemination, the ethics of representation and collaboration (Bruhns; Hadaway). So when Karen Downey of Belfast Exposed extended an open invitation to undertake a commission with the organization I proposed to pursue my research into archiving practices with their collection and to make a new body of work with homeless people living in Belfast. My intention was to undertake the commission in two strands in order that I might reflexively develop the strategies I was using to create and compile material for the collection, whilst at the same time critically consider the implications of potentially constituting this collection as a public archive (Downey and Luvera). In Belfast I made contact with two homeless support services. The Simon Community provided me with a meeting room in South Belfast for a short time after which I continued working at the Welcome Organization in West Belfast. The “Welcome Centre” was an important hub for a tight-knit community of people from all parts of Belfast who had found themselves without permanent accommodation for many different reasons. The drop-in centre pulsed with a constant stream of people milling through and shouts for “another coffee or tea?” A television blared from the moment the doors opened until the last person left around midnight, seven days a week. I helped staff in the kitchen prepare and serve lunch and dinner, and I began to meet people. When opportunities arose I told the people I met about my work with photography. I explained that I had been collecting and making photographs with homeless people living in London and that I had come to Belfast to consider what to do with this collection by exploring the Belfast Exposed archive, and to create similar work with homeless people living in Belfast. I answered questions and invited those who were interested to take cameras away and to meet with me regularly to discuss the photographs they had made. I encouraged all of the participants to photograph the things that interested them and I gave technical advice on using the cameras. Some people made photographs of their friends, family, special places and significant times, while others had more idiosyncratic uses for the camera in documenting their point of view, experience or memories of living in Belfast. 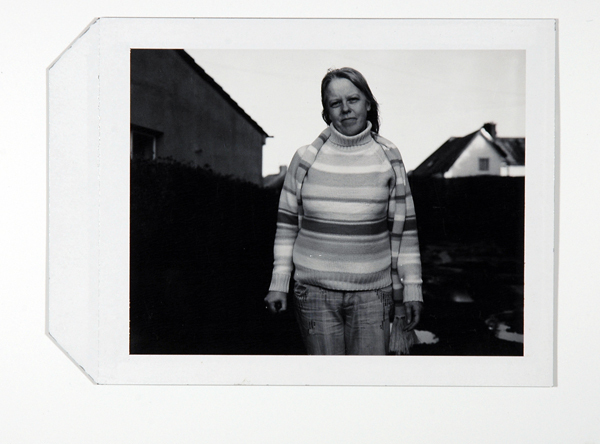 Polaroid from the making of Assisted Self-Portrait of Angela Wildman, Residency, 2006–2008. 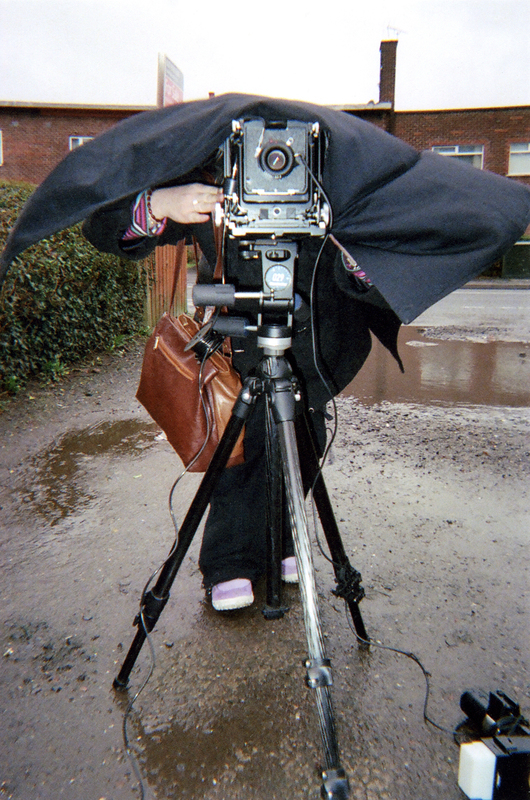 Polaroid from the making of Assisted Self-Portrait of Caroline McDonnell, Residency, 2006–2008. After several weeks I invited participants to learn how to use large-format camera equipment to create an Assisted Self-Portrait. In order to produce an Assisted Self-Portrait, I met with each participant over the course of a number of meetings to teach them how to use a 5 × 4 field camera with a tripod, handheld flashgun, Polaroid and Quickload film stock, and a cable shutter release. The final image was then edited with the participant. The aim was to invest in the participant a more active role in the creation of their portrait representation than is usually offered in the transaction between photographer and subject. Each Assisted Self-Portrait is the trace of a process that attempted to blur distinctions between the participant as a “subject” and me as the “photographer” during the photographic sitting (Luvera). When creating an Assisted Self-Portrait I asked each participant to take me to a place they found interesting, personal or memorable in some way. For a participant called Angela Wildman it was the nostalgic pull of an address that was once a family home; a place she had not revisited for over a decade. For Caroline McDonnell it was a green space next to a housing development on the very edge of the city where she had spent much time as a youth. For Sean McAuley it was a street along a peace line in an area of Belfast where he had lived his whole life before experiencing issues with accommodation. Sean told me that he saw this area as being particularly significant to him for it had been razed and rebuilt after a notorious Troubles-related arson attack; he said that he hoped to re-establish himself in this particular part of Belfast again soon. This process of accompanying participants to visit sites where their past experiences had once played out or to the places where their projected aspirations were located seemed to add an important dimension to the process of making the Assisted Self-Portraits. It was through these journeys that I came to develop my understanding of both the topography of Belfast and the outlook and experiences of the individuals I was working with. I felt that it was important to document the process of working with the participants in the sites that held meaningful associations for them in order to attempt to emphasize what I saw as the reclamation of place by the participants. These images represent the process of engagement between the participant, the medium and me, which I see as being integral to the work, and in many ways significantly more important than the finished Assisted Self-Portraits. Documentation of the making of Assisted Self-Portrait of Angela Wildman, Residency, 2006–2008. Documentation of the making of Assisted Self-Portrait of Caroline McDonnell, Residency, 2006–2008. Over the past thirty years the Belfast Exposed archive has grown from a rudimentary system of distinguishing and filing the “Good Negs” (these early files are still preserved within the collection), to a complex and rigorously conceived classification scheme of principal headings, subheadings, meta-data, descriptions, keywords and digital interactivity. At the time of my engagement with the Belfast Exposed archive, the collection was catalogued in chronological order with three principal descriptive headings in use: “Portraits”, “Political Landscapes” and “The Community”. These main subject areas were subdivided into various themes, each of which was further subdivided. For instance, “Portraits” was divided into “Public Figures” and “The Community”. In “The Community” there was “Adults”, which was then divided into eleven categories including: “Looking towards the camera”, “Adults – head/shoulders” and “In Situ”. In “Political Landscapes” the collection was subdivided into “Funerals”, “Public Events”, “Peace Process”, “Political Activists”, “Security” and “Sinn Fein Ard Fheis 1986”. Most images had descriptive information attached including the name of the photographer, the date the photograph was taken and sometimes an explanation of the circumstances or subject of the creation of the image. The formation of the Belfast Exposed archive and its continued production and acquisition of images is predicated primarily on a representation of the social, political, cultural and economic circumstance of Belfast through the Troubles and post-peace process. 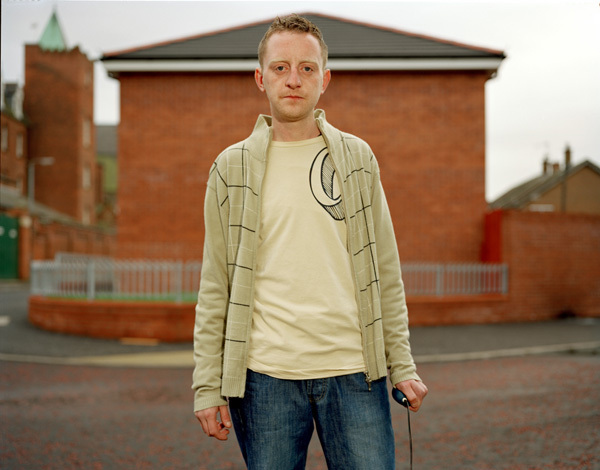 Sean McKernan, one of the founders of Belfast Exposed, has said that the main intention that ignited the project was an endeavour of collective self-representation: “there was a lot of media censorship in Belfast at the time and we felt that the community should have a voice through the medium of photography” (McKernan). The material in the Belfast Exposed archive is predominantly contextualized as a representation of place in terms of landscape, public events, politics and community, as opposed to the individual experience and personal expression of the photographers. This is reflected in the archive’s classification scheme through the predominant use of headings that reflect the specificity of the social, political and cultural activity and architectural condition of Belfast (for instance: “Peace Lines”, “West Belfast Festival”, “Battle of the Boyne Re-enactment” or “Care for the Elderly”), or the representation of a “type” or physiology of a subject in the photograph (including: “Teenage – half/full body”, “Baby”, “Children/With Balls” or “Artists and Facilitators”). On Gateways the archive user is given an option to contribute to the descriptive information of individual images by typing into a form or making a voice recording that is then sent to the archivist for consideration for inclusion. This interactive facility of the archive might be seen as offering a form of self-representation in the archive by enabling the archive user – who may indeed be the photographer or the subject of the image itself – to contribute directly to the contextual anchorage of the material held in the archive. Encountering the Belfast Exposed archive enabled me to reflect directly on the storage and organization of the 10,000 or so images and other material that I had collected, and to develop some of the initial questions that I had for my collection about its potential constitution as an archive. The collection is currently stored in my studio in filing cabinets, shelving, cupboards, boxes and hard drives. The negatives and photographs (both analogue and digital) are organized by the names of the participants and the dates on which they were created. Individual photographs or series of images are supplemented by descriptions and stories told to me through letters, emails and maps, and conversations both recorded and recollected. There are also journals, workbooks, sound recordings, interview transcriptions and other more idiosyncratic objects that have been gifted; including a reproduction of a prenatal ultrasound scan and a Fedora hat handmade by a participant. Edits and selections chosen by the participants and me, independently and together, have been assembled and these are marked out and stored separately. Documentation of how some of these selections have been used in exhibitions and publications are also contained in the collection. Various individuals and organizations have requested to use images from the collection for commercial purposes or in contexts outside of my practice over the years; including a bible manufacturing company, a homeware manufacturer, social work agencies, advertising firms and Hollywood feature film costume designers. These requests have been declined or deferred until concrete decisions about the manifestation of the collection as an archive have been made. Upon examining the earliest material contained in the Belfast Exposed archive it seemed to me that archives not only represent what they contain but they also retain the traces of how they came into being, how they have been organized and stored in the past, and how this has developed over time. I noted that enabling a perception of the structural and organizational evolution of an archive could be just as useful or informative to an outside user as a selection drawn from the collection itself. I wondered: if I did allow entry to my collection what kind of storage systems would best enable physical and conceptual access to specific items? How could these systems be designed in such a way as to preserve the organizational structures and selections that have evolved so far? I also contemplated the more difficult question of how might any redesign of the storage and organization of the collection represent the processes of dialogue, trust, negotiation and questioning that generated the material in the first place? Further questions to do with classification and ordering surfaced. I reflected on the dichotomy and partnership between chronology and inventory, and how modes of selection and interpretation can often be masked by false neutrality implied through these schemes (Sekula). I considered Edwards’ discussion on how artists can disrupt the structures of collecting practices and the interpretation of representation in collections to “destabilise semiotic and epistemological habits”, by focusing on mediation and metaphor – the “processes of seeing and translating, rather than the content of the image” (Edwards, Raw Histories 203–05). I reflected on the complexity of deciding on what topics, themes, keywords, meta-data and descriptions could be used to navigate users to specific images without the input of the participants who created the material. What criteria would I use to break up the collection into a system of parts that enabled multiple routes through to a particular image or item? How could a participant’s contribution to the collection be organized across a classificatory system in a way that enabled the archive user to understand the intentions or experience of that individual? How might the participants feel about the way in which they had been described or (mis)represented through this new archival system? I would like it [my representation] to be positive, not negative. Everything in that newspaper was negative about me. It was all negative. Nothing in it was good. Nothing. Caroline McDonnell/Anthony Luvera, Assisted Self-Portrait of Caroline McDonnell, Residency, 2006–2008. A wee while ago I couldn’t have imagined myself ever being homeless. And it’s what I am but it’s just another thing and I’ll move on to something else. Hopefully. But I’m very positive about the whole thing you know. Homelessness isn’t always a bad thing. It’s something that’s an experience and then hopefully you get yourself together and then you move on. Lots of people have referred to me as vulnerable. I hate that bloody word because I’m bloody well not. I don’t see myself that way at all. I’ve been through a lot and okay silly and daft things have happened, but I’ve come through and I’m stronger. 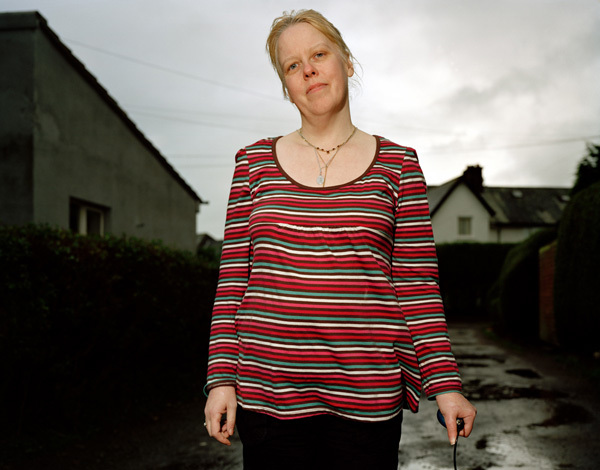 Angela Wildman/Anthony Luvera, Assisted Self-Portrait of Angela Wildman, Residency, 2006–2008. Caroline and Angela’s comments reminded me of Hall’s assertion that identity might be most usefully understood “as a ‘production’ which is never complete, always in process, and always constituted within, not outside representation” (Hall, “Cultural Identity and Cinematic Representation” 68). The creation of the collection was predicated on inviting the participant in a process of representation by creating a “self- representation”. Could this process be extended through the constitution and ongoing running of an archive? How might participants be able to evolve their entries in a classification system as they grow and develop their opinions and points of view about the experiences depicted in the images? What about those with whom I am no longer in touch – those who have disappeared, “moved on” or in some cases died? The notion of a static classification scheme seems to be at odds with the complexity, chaos and change intrinsic to human experience and specific identities (Edwards, “Ordering Others”). In her discussion on the development and crystallization of the “image of homelessness” in the late twentieth century, Martha Rosler forcefully critiqued the reductionist tendencies of the media and state agencies in representing the complexity of the “dimensions” of homelessness. “Homelessness, like all social problems, exists in a stream of conflicting representations. The image of the homeless person has undergone several metamorphoses over the past couple of decades.” While the development of statistics on homelessness may expand an understanding of the outline of variation in the “homeless population” (broadening to include people described as asylum seekers, refugees, ex-servicemen and women, single parents, teenage runaways, families, etc.) there is relatively little information available about the experience of being homeless as told directly by the individual (Rosler, “Fragments of a Metropolitan Viewpoint” 20). The reasons, circumstances and points of view specific to each participant’s experience of homelessness are as varied and many as there are contributions to the collection. The diversity of these perspectives might be seen as one of the most interesting and potentially most informative features of the collection. However, there seems to me to be much complexity in preserving yet attempting to make sense of this heterogeneity through the ordering and cataloguing of an archival system. And while the participants’ photographs could be anchored to various degrees with descriptions and administrative protocols designed to assert their intentions for the images and the contexts they may be used in, who would assess and deem whether any outside requisition opportunities are in key with the participant’s wishes? How might profits be dispersed on the licence or sale of the images? Despite the written and verbal agreements between the participants and me in relation to the ongoing use of their images, would it be legitimate for me to make decisions relating to the use of their images in contexts outside my practice? This was here, that did happen, they lived here. Who wants to know anyway? The first time I was a bit apprehensive about it. Thinking like I haven’t took photos of myself before. I don’t really like getting photographed. But then having to do it myself, to me, was . . . I don’t know. I was just thinking what am I taking a photograph of me for? It’s a bit big headed but I enjoyed it. After the first time it was pretty good. It started getting easier. I felt part of it, so I did. At the start I did really think, this isn’t for me, it’s a bit boring. But the second time I really enjoyed it, like setting up the camera and stuff, it was brilliant. But my first initial reaction was like, what is the point like? Who wants to know anyway? It’s just these homeless persons. So? . . . I actually thought it came out pretty good in the end. Aye I thought it was more than okay. Sean McAuley/Anthony Luvera, Assisted Self-Portrait of Sean McAuley, Residency, 2006–2008. It seems to me that forms of self-representation may go some way to broadening our understanding of individuals whose portraits are depicted primarily through the trace of their brushes with the institutions of commerce, charity, law and the state, or in representations produced by social documentarians. The archival registration of an individual through details recorded on their birth and death certificates, education reports, electoral roll details, housing status, health records or legal documentation can provide only a limited outline of the life experience of any person. Filling in some of the remaining gaps and absences of the archival record with the first-hand representation of the points of view of people who would otherwise leave little material trace of their lives in the repositories that feed history and memory may offer a more complex, nuanced and varied understanding of the experience of homelessness (Cooke). However, while handing over the camera to a subject/participant may offer the individual an opportunity to represent their point of view or express their subjectivity, it won’t necessarily get the artist or audience any closer to “reality”. Self-representations will always be framed, directly or indirectly, by the artist or organization facilitating the processes employed to generate and circulate the material. Issues of context, reception, authorship, ownership, commissioning and the historiography of what or who is depicted, may have the effect of reinstating the inequality of the power balance that was removed from the photographic methodology employed to create the image in the first place (Rosler, “Post-Documentary, Post-Photography?”). Both history and memory are discursive formations that gather support for their narratives from the archival record (Foucault; Hall, “Constituting an Archive”). If archives declare: this was here, that did happen, they were here – then in order to expand the possibility of providing a more replete representation of people who might otherwise be forgotten, excluded or spoken for, the archival record must be supplied with a greater diversity of sources, accounts and representations of those individuals. It is essentially an interpretation of this premise that has driven my work with the collection: efforts to find new contexts and ways in which to meaningfully disseminate the material, and attempts to resolve appropriate form(s) in which the collection may continue to be accessed and used. I have remarked in the past: “I had never wanted to photograph homeless people before” (Luvera 14). However, almost a decade later I find myself still entangled in questions of representational responsibility and social difference. In negotiating a practice based on co-production, facilitation and degrees of collaboration in an attempt to represent others and their experiences, it appears to me that my practice with photography will go on, so long as I am mindful to question and re-question, and be questioned, even if that means some of these questions linger without conclusion. 1 For most of the time I worked in Belfast I stayed at the home of the artist Rita Duffy and her family. Rita offered much invaluable support and advice based on her experience of working in socially and politically engaged community art contexts in Northern Ireland over the past thirty years. I note this to impart a sense of the importance of Rita’s counsel on working in an unfamiliar and very particular context, and also to extend heartfelt thanks to Rita, John, Conor and Eoin for all of their hospitality and generosity. Residency, Assisted Self-Portraits Belfast was exhibited at Belfast Exposed Photography from 21 March to 25 April 2008. 2 I am particularly grateful to Karen Downey for her support throughout this process and for our many long, informative and critical discussions. I am also thankful to John Duncan, Pauline Hadaway, Sean McKernan, Mervyn Smyth and Karen Quinn, and all of the Belfast Exposed staff, trustees, volunteers and interns who shared their time, knowledge and information with me. Many thanks also go to Bruno Ceschel, Nathan Firth, Magdalene Keaney and Tom Pye. Belfast Exposed’s Online Archive. <http://www.belfastexposed.org/archive/index.php>. Bruhns, Martin. “Belfast Exposed.” Source 33 (2002): 49–51. Campbell, Duncan. Falls Burns Malone Fiddles (2003). Cook, Terry, and Joan M. Schwartz. “Archives, Records and Power: The Making ofModern Memory.” Archival Science 2 (2002): 1–19. Cooke, Pat. “Perish the Thought: Collections and Absences.” Arkive City. Ed. Julie Bacon. Belfast: U of Ulster, 2008. 24–34. Derrida, Jacques. Archive Fever. Chicago: U of Chicago P, 1998. Downey, Karen, and Anthony Luvera. “Photographs and Assisted Self-Portraits: A Public Archive?” Footnotes. Ed. Sarah Pierce and Julie Bacon. Belfast: U of Ulster, 2007. 89–109. Edwards, Elizabeth. “Ordering Others: Photography, Anthropologies and Taxonomies.” In Visible Light. Ed. Chrissie Iles and Russell Roberts. Oxford: Museum of Modern Art Oxford, 1997. 54–68. ———. Raw Histories. Oxford: Berg, 2001. Flinn, Andrew, Mary Stevens, and Elizabeth Shepherd. “Whose Memories, Whose Archives? Independent Community Archives, Autonomy and the Mainstream.” Archival Science 9 (2009): 71–86. Foucault, Michel. The Archaeology of Knowledge. London: Routledge, 1972. Hadaway, Pauline. 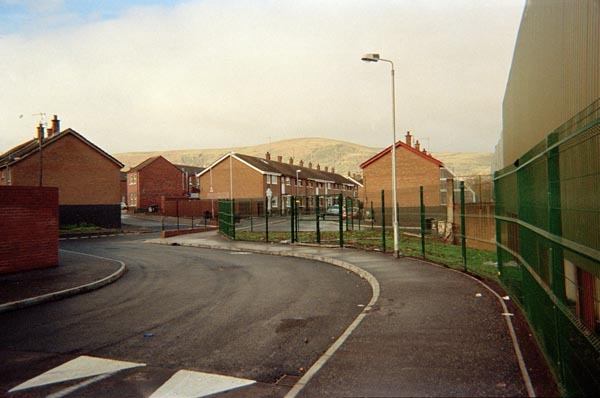 “A Cautionary Tale – The Experience of Belfast Exposed.” Printed Project 8 (2007): 10–20. Hall, Stuart. “Constituting an Archive.” Third Text 15.54 (2001): 89–92. ———. “Cultural Identity and Cinematic Representation.” Framework 36 (1989): 68–81. ———. “Reconstruction Work: Images of Post-War Black Settlement.” Family Snaps. Ed. Jo Spence and Patricia Holland. London: Virago, 1991. 152–64. ———. “Whose Heritage? Un-settling ‘The Heritage’, Re-imagining the Post-Nation.” The Politics of Heritage: The Legacies of “Race.” Ed. Jo Littler and Roshi Naidoo. New York: Routledge, 2005. 23–35. Johnson, Valerie. “Creating History? Confronting the Myth of Objectivity in the Archive.” Archives 32.117 (2007): 128–43. Luvera, Anthony. “Photographs and Assisted Self-Portraits.” Source 47 (2006): 14–17. McDonnell, Caroline. Personal interview. The Welcome Centre. Jan. 2008. McAuley, Sean. Personal interview. The Welcome Centre. Jan. 2008. McKernan, Sean. Email correspondence. Feb. 2010. O’Reilly, Brendan. “Why Belfast Exposed.” Belfast Exposed Magazine 1 (1985): 2. Rosler, Martha. “Fragments of a Metropolitan Viewpoint. ” If You Lived Here: The City in Art, Theory, and Social Activism. Ed. Brian Wallis. New York: New, 1991. 15–43. ———. “Post-Documentary, Post-Photography?” Decoys and Disruptions Cambridge, MA:MIT P, 2004. 207–44. Samuel, Raphael. Theatres of Memory. London: Verso, 1994. Sekula, Allan. 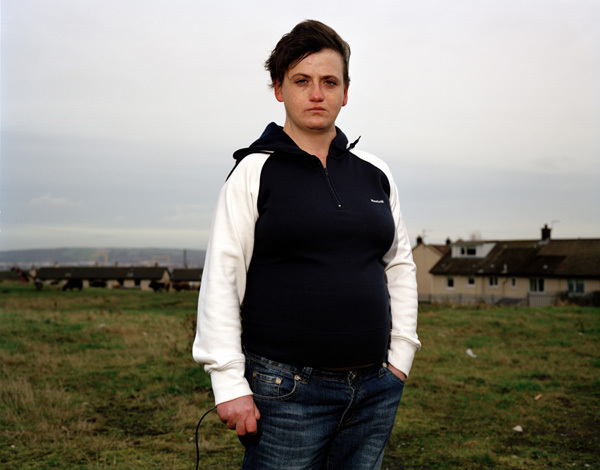 “Reading an Archive: Photography between Labour and Capital.” Photography/ Politics Two. Ed. Patricia Holland, Jo Spence and Simon Watney. London: Comedia, 1986. 153–61. Wildman, Angela. Personal interview. The Welcome Centre. Jan. 2008.